Your dog has had major surgery on a main weight bearing leg and will need some special attention from you at home. 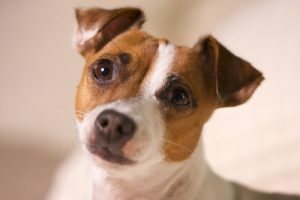 It is very important that you follow these instructions, so that your dog will have the best chance for a good recovery. You will notice a rather large incision down the thigh/knee area. Watch this area for changes that may indicate a problem, such as swelling, redness, or discharge. If you notice anything unusual, please call the office for an appointment to have it checked. You will need to return in 10 days for a recheck and removal of any external sutures. We would also like to see the dog back again approximately 6 weeks post-op for a recheck to make sure everything is progressing as it should. Exercise must be controlled, as allowing the dog to use the leg too much or too quickly can cause problems with the healing and overall success of the surgery. Your dog must be kept on a leash for at least the first 3 months after the surgery. Tying the dog up and leaving it outside alone, or leaving it loose to run in the yard is not allowed. Exercise should be limited to walking only – no running, jumping, or quick turns. Don’t throw things for the dog to chase or retrieve. Going up and down stairs is allowed, but some help may be needed during the initial recovery period. Start with short walks at first, several times a day if possible, and gradually increase the length as the dog progresses. This will help to keep the muscles strong and supple, and aid in a more complete recovery. Refer to the area below for specific instructions and timeline on what you need to do to aid in your dog’s recovery. In most cases, one of the main reasons dog end up with this type of injury and require surgery is that they are overweight. Obesity is very stressful on all the joints of the body, thereby making them much more susceptible to injury. If your dog is overweight, then putting it on a strict diet is the single most important thing you can do. Weight loss is vital for a complete recovery, and is one thing that you as a pet owner can control. No dog will do well after this surgery if it continues to be overweight. Patience is key, and every dog progresses at its own rate. Moderate exercise, weight loss when indicated, utilizing the rehab tools below, and time should bring good results. If you have any questions or feel that your dog is not doing as well as it should, please don’t hesitate to call the office. Restrict activity, confine when unattended. Stairs are allowed but assistance with a sling may be necessary. Keep on leash for all outdoor elimination. Ice area for 15 minutes, 2-3 times daily. PROM (Positive Range of Motion) 2-3 times daily. Begin short, slow walks (5-7 minutes) daily. Apply heat to area 2-3 times daily for 10 minute increments. Protect heat source with a towel to prevent burning. Decrease PROM to once a day. Stretch knee and hip 3-4 times daily, holding stretch for 10 minutes. Increase walks to 10-15 minutes, 2-3 times daily. Can increase speed to a trot. Increase Walks to 25-30 minutes. Begin off-leash time in a controlled, supervised environment starting with 5 minute intervals, and gradually increasing time.